Conceived as an exercise in restraint and simplicity, Aristotelica is typographic eulogy to the simple beauty of circular shapes. It shows its strengths mostly in display uses and logo design, with a palette of moods ranging from the stark elegance of the uppercase hairline weights to the playful softness of the lowercase bold weights. All Aristotelica fonts include Greek and Cyrillic alphabets as well as an extended range of latin characters, covering over forty languages. Open type features includes stylistic alternates, old style and lining figures and small caps. 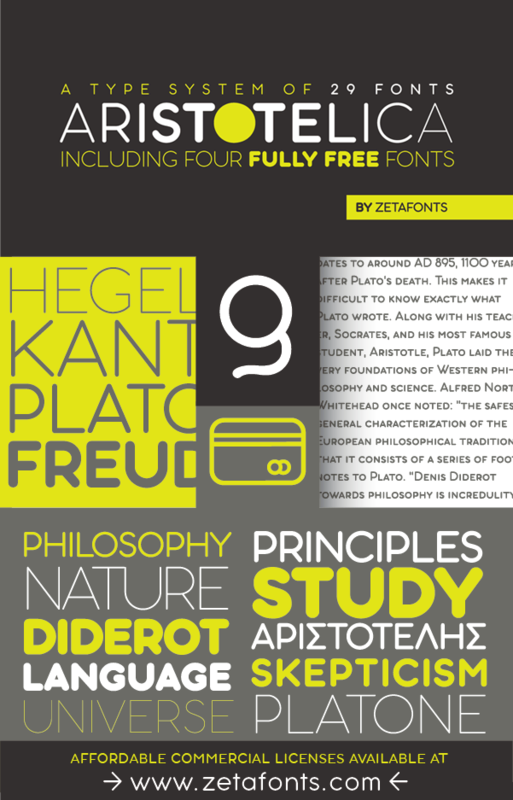 A text variant, Aristotelica Text has been developed for seven out of the eight display weights, applying slight corrections to design and metrics to allow for better legibility in paragraph text. The family is further enriched by the inclusion of Aristotelica Icons, a set of matching variable-width monoline icons that can be used to faultlessly match the typeface line width.